Web development is fast becoming one of the most attractive fields to work in. Pretty much every single major business in the world has at least some sort of web presence. In fact, having a good website and social media presence is becoming a major factor in business success. Although platforms like WordPress and Wix allow people to build their own websites without any coding or web development knowledge, they simply aren’t an effective substitute for an experienced web development team. As you can imagine though, every web developer has to start somewhere. This has led to a large number of junior web developer jobs becoming available, providing plenty of good reasons to start learning to code. Through this article I will take a look at what an entry level web developer is. I will explore your job options as a junior developer, and I will touch on how much you can expect to earn. Finally, I will explore the skills and programming languages which will help you when you are searching for junior web developer jobs, and I will look at at a few tips to help you land your first job. 1 What Is A Web Developer? 2 What Sort Of Junior Developer Jobs Are Out There? 3 What Is An Average Junior Web Developer Salary? 4 What Sort Of Skills Does A Junior Developer Need? Back-end developers, who usually work on the server-side of the website. This means that they do things like create web apps, build programs that collect and store consumer data, and control the way your website interacts with the server. Back-end developers usually learn languages like PHP, Java, SQL, and Ruby. Full-stack developers, who usually have years of experience, and who have an in-depth knowledge of both front and back-end development. Full-stack developers usually head development teams and oversee a number of less experienced developers. Junior web developer jobs usually consist of working with a team of senior developers. They are usually responsible for creating basic code, for working alongside senior developers, and for streamlining the entire development process. Although you may not find it very interesting to work as an entry level web developer, remember that it’s like anything – as you gain more experience you will hopefully land promotions and progress up the career chain. The demand for experienced web developers means that junior web developer jobs are becoming more and more common, and the good news is that it’s super easy to learn the skills you need to land your first job! But more on that in a while – let’s start with a look at what sort of jobs you can expect to land with your newfound development skills. What Sort Of Junior Developer Jobs Are Out There? In the past, web developers had to have a degree in computer science to break into what was a very competitive field. Although still competitive, the demand for knowledgable web developers means that it is no longer essential to go to university to become a developer. Some of the best junior web developer jobs are open to developers from all walks of life. Employers are becoming less concerned with how you learn your skills, and instead are focusing more on what skills you have. As you can imagine, this opens up a world of opportunities for people who are learning web development skills in their spare time. Website design, including custom theme design for platforms like WordPress and Wix. This sort of work requires the typical front-end languages, and it is great for people who are creative and who like designing things. Website construction, which includes jobs like building a website and its pages according to someone else’s design specifications. This sort of job requires a very good understanding of CSS, as you will often be required to tweak different design elements. Back-end web app creation, which will involve you writing or helping to write the code to build the web apps required for your website. This usually requires a working knowledge of Java, PHP, and/or Ruby. Data analysis using SQL to help inform marketing and other business decisions. These are just a few of the things that may be included in junior web developer jobs. If you are the youngest member of the team you can also expect to be stuck with all of the boring tasks that no one else wants. Yes, that includes making the coffees! What Is An Average Junior Web Developer Salary? 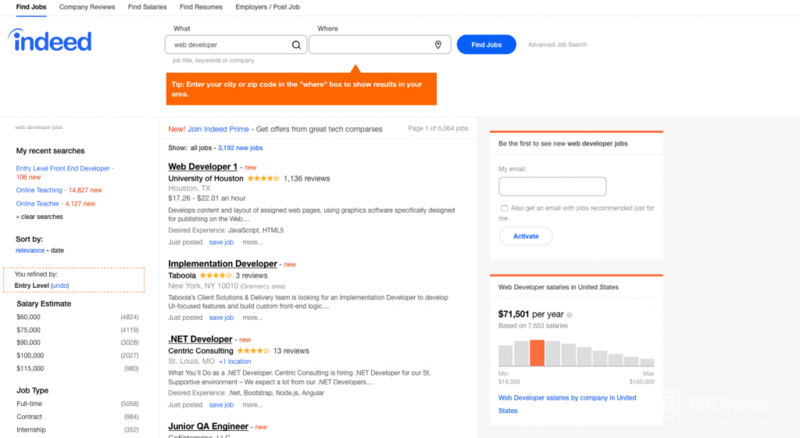 A quick search on Indeed.com, one of the largest online job boards in the USA, reveals a massive 6000 junior web developer jobs! The average junior web developer salary is just over $70,000 USD – significantly above the US average salary of around $50,000 – and this is for an entry level job! The massive salaries commanded by web developers is in part due to the shortage of experienced developers, and in part due to the fact that it is seen as a highly skilled profession. While this is true, what other highly skilled job can you learn through a couple of months of online courses? Obviously, your junior web developer salary will increase as you gain experience. You can expect to earn well in excess of $100,000 per year once you graduate from your junior web developer position. Alternatively, you can work as a freelancer and start charging rates of $70+ per hour immediately! What Sort Of Skills Does A Junior Developer Need? If you are serious about becoming a web developer, you will need to develop a wide range of skills. Obviously, your ability to work with your chosen programming languages is essential (more on that on a minute), but you will also need to learn other skills if you want to put yourself ahead of the pack and land your first junior web developer jobs. Learning to problem solve. Troubleshooting is a major part of programming. It is very rare to be able to write the perfect code the first time. In most cases, you will run into problems where things don’t go quite as expected and where you need to develop solutions. The ability to problem solve efficiently is crucial if you want to have a chance when applying for junior web developer jobs. Being able to work in a team. Unless you are freelancing for small clients, you will probably be required to work as part of a team when you land your first web developer job. Practice working with other people where possible, and make sure that you are comfortable being the junior member of a team. Being able to come up with innovative solutions. So, imagine that your employer has just given you an assignment which you have no idea how to complete. What do you do? If you are serious about becoming a decent developer, you need to be able to come up with solutions to difficult assignments in a creative, efficient manner. Practice doing so as you learn to code. HTML is present on pretty much every single website on the internet. Short for Hypertext Markup Language, HTML allows you to present text and other content in a way that computers and web browsers can understand. It allows you to build lists and tables, to define headings, and to insert videos and images. For most aspiring front-end developers, HTML is a great first language to learn, especially if you don’t have a lot of coding experience. It is quite simple, it is relatively easy to follow, and it doesn’t have a lot of complicated syntax. The best thing is that once you have learned HTML – something that usually doesn’t take more than a few hours – you will be able to start crafting your own basic web pages almost immediately. If you are wondering how to get a junior web developer job and are thinking about trying to become a front-end developer, you should start by learning HTML. Head over to the BitDegree platform and have a look at the HTML courses on offer. The Comprehensive HTML5 Tutorial will teach you everything that you need to know to start coding in HTML, while the HTML Coding for Beginners course will teach you the basics of HTML in just an hour of simple video lessons. The next language you need to learn – and one that you will probably start learning soon after you begin your HTML course – is CSS. If HTML is the content management language of the internet, CSS is the styling language. It allows you to change everything from the color, size, and style of your fonts to the shape of your images and where they are found on your webpage. CSS is essential for any aspiring front-end developer, and it is actually often taught in conjunction with HTML. Although it is usually written in its own document, CSS commands can actually be inserted directly into HTML code, allowing you to make fast, easy changes to your web pages. 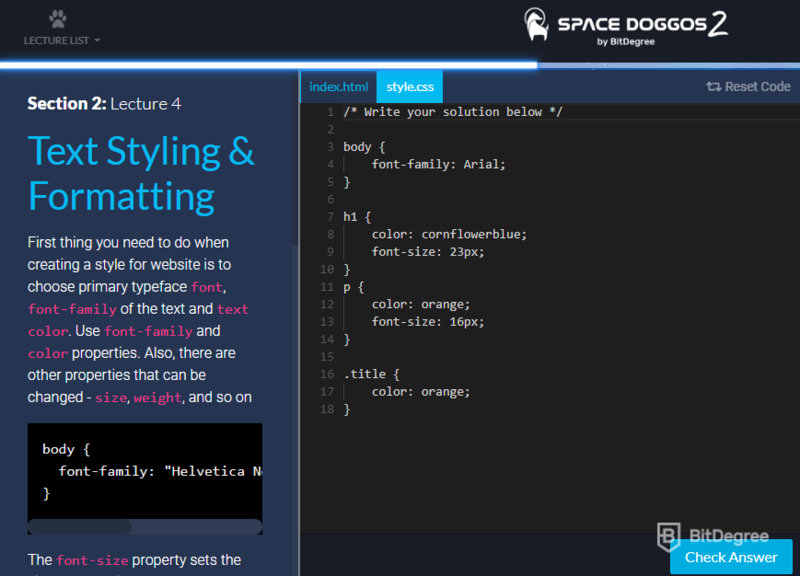 If you want to learn CSS, look at the Interactive Coding for Beginners course. 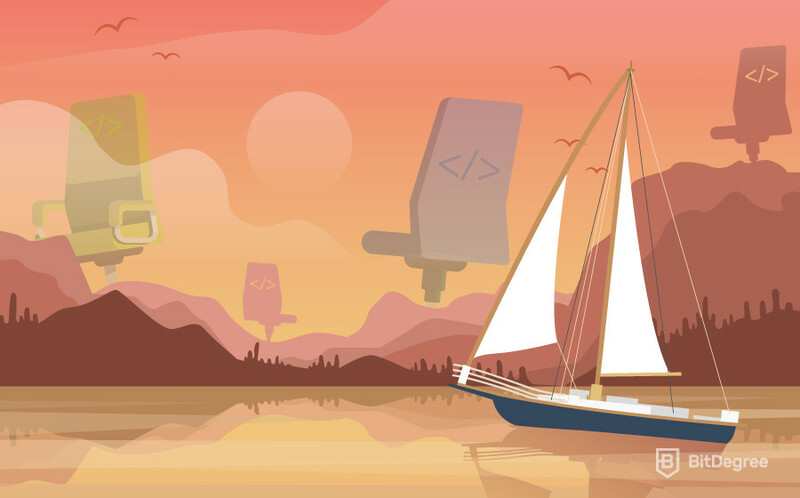 This course will teach you the basics of both CSS and HTML with a web development focus. It is fun, engaging, and it will leave you motivated to keep learning. Java is probably the best back-end language for beginners to learn first. It has quite simple syntax, it reads like English, and it is super versatile. However, it isn’t as easy as languages like HTML and CSS, which is definitely worth keeping in mind when choosing between front-end and back-end developer paths. BitDegree offers one major Java course – the Learn Java 101 Tutorial – that is designed for beginners who don’t have a lot of coding experience. Through this course you will learn how to code with Java, what you can do with Java, and what different Java syntax does. Importantly for aspiring web developers, you will also learn how to build server-side elements and web apps. PHP is one of the most popular programming languages in the world. It was designed for the web, and is now used by over 80% of the top 10 million websites. PHP is mainly used to develop back-end web apps for things like shopping carts and sign-up lists. This means that there are a lot of opportunities for people who want to work in PHP development simply scaling and maintaining existing programs. PHP is a great language for freelancers, and it is essential for any aspiring back-end developer. It isn’t too hard to learn, and there are plenty of ways to practice it. If you would like to find junior web developer jobs, then start by learning PHP through BitDegree’s Interactive Learn PHP Online Tutorial. 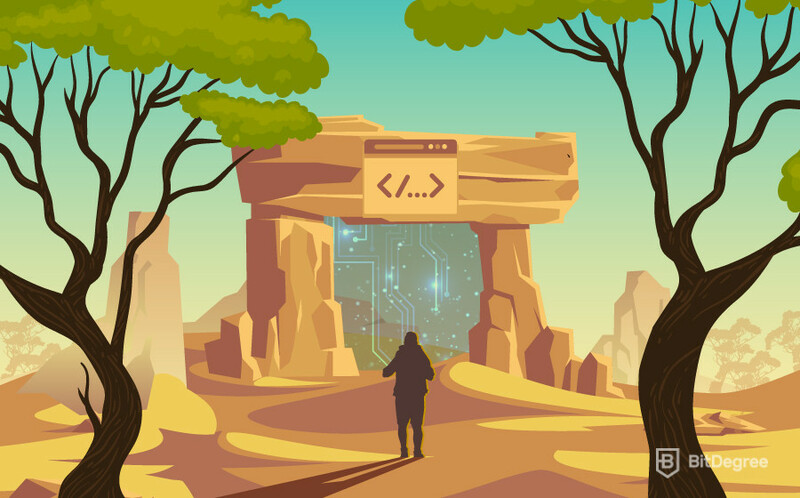 This course will teach you the basics of PHP, how you can write high-quality code with PHP, and how you can use PHP to develop web apps. SQL is a little different from most of the languages on this list. It is almost exclusively used for database management and data analysis. This allows major companies – including eCommerce leaders like eBay and Amazon – to analyse complex consumer and business data. These analyses can help inform marketing and other business decisions. It is important for back-end developers to have at least some understanding of SQL, especially when they are working with websites with large databases. Having a working knowledge of SQL will make you a lot more employable, increasing your chances of landing your first web developer job. The Interactive SQL Tutorial is a great place to start learning. It will teach you basic SQL commands and how to use them to manage and analyse company data. Now that we’ve covered what a junior web developer is, what you can be expected to do as a junior developer, and what skills you need, it’s time to look at getting your first job. If you’ve ever thought about how to get a junior web developer job, keep reading – the following tips should help you get started. One of the best ways to find out about new openings for junior web developer jobs is to network with other junior developers. You could do this by joining your local Meetup group, by joining an online community, or simply by engaging in discussions on a website like Reddit. Prospective employers will want to see some evidence that you have the experience that you claim to have. The best way to do this is to build a portfolio website of all of your completed projects. In a sense, your website will become the most important element of your portfolio. It will showcase your ability to create a responsive, well-designed site – especially if you want to become a front-end developer. As a new programmer, it can be hard to find ways to practice writing code and gain experience. One of the best ways to do this is to pick up a bit of freelance work. Have a look at a platform like Upwork, apply for a few jobs which you think are right for your skill level, and get started! Make sure that you ask your clients if you can add your work for them to your portfolio! Once you have written a decent resume and have started to build a portfolio, start applying for jobs! Don’t be afraid of rejection – everyone gets knocked back from time to time. The practice will make you better at applying for jobs in the future, especially if you reach the interview stage, and you will land one eventually! Junior web developers are in demand throughout the world. Learning the skills to become a junior developer is quite easy. In fact, you can learn pretty much everything through online courses like those offered by BitDegree! Start by researching the difference between front and back-end developers, decide which one interests you more, and start learning! Enrol in an online course, practice your code, and practice writing your own programs and building your own websites. Once you feel that you have a working knowledge of at least a couple of languages, you can start looking for jobs. Begin with freelance projects that will help you build a portfolio. Once you have a decent portfolio which showcases your skills, start applying for jobs. Good luck, have fun, and I hope that this article helps you get started in your new career as a web developer!